Here’s an old one and a tad bit obscure. I remember first buying this on tape when it came out. I saw an ad in a magazine and thought the cover looked cool. Remember back in the old days when you had a good chance of picking a good band by their album covers? Not so much these days. 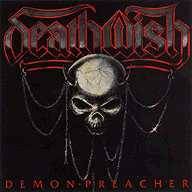 Deathwish hailed from England. While this isn’t a great thrash album by any stretch of the imagination, it’s worth giving a listen to once a year or so. I picked it up on CD a few years after its release and got it in a cutout bin for maybe $5. What an investment it was! A few days ago I sold my copy on eBay for $65! « Poll: Ride The Lightning vs. Peace Sells…But Who’s Buying? I remember seeing the cassette in the metal in as I flipped through back in the day. Never heard it though.